For my Wednesday night class this summer, I wanted to go through the Fruit of the Spirit in order to work on some character qualities that I noticed were starting to be lacking in my class. I knew that the Ministry-to-Children has a grand array of lessons to choose from and so I did a search in order to see what they had on the subject. I quickly found Kara Jenkins’ lessons on each of the Fruit of the Spirit as well as the coloring pages by Mandy Groce. These were so great! We have been working on looking up verses in the Bible, so I wanted to have a page for them to work on during class. I put together these worksheets that worked well as take-home pages as well, so that the parents knew what we were learning in class. 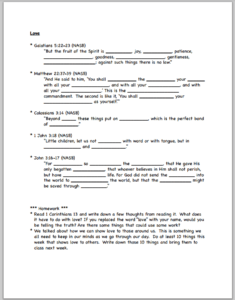 These worksheets have Bible verses to look up as well as homework for each week. Click here to download all the worksheets in one PDF file, or click on individual links below. Have been using the Fruit of the Spirit lessons with our kids on Wednesday night Bible studies. Thanks for these well-done lessons. Our kids are learning about how God wants us to live and how to treat others. Tony Kummer (Editor) reviewed & updated this page on : October 22, 2013 at 11:26 am. All our content is peer reviewed by our readers, simply leave a comment on any post suggest an update.